I’m headed to the dentist in just a bit and gave my chompers one last exercise before I go! I didn’t get to bed until 11:30 last night (thanks to a 10PM dinnertime!) and knew I wouldn’t be able to get in 8 hours of sleep AND a run, breakfast and blogging before my appointment. So I thought through my options and decided that I could – gasp – go without a shower to the dentist and run in the neighborhood there afterwards. I never, EVER used to leave the house without a shower (unless it was in running form), but since I took a shower at 9:30 last night, I feel pretty clean. I’m dressed in workout clothes and put on some make-up and jewelry to look nice . I had quite the gingerbread breakfast, as you probably guessed. This gingerbread muffin is quite strong – in a good way!! It was an AWESOME bowl! Is that a kidney today? Perhaps a lima bean? Good luck! Will you please come over and make me some oatmeal? Pretty please? I LOVE the dentist!!!! I don’t know why, but maybe because I am forced to just relax? I think your coffee is a big mouthed character sideways… see the two little eyes in the middle?! Good luck with the dentist and enjoy your run in the old hood! This is a common occurrence. 🙂 THe easiest thing to do is to use a bigger bowl. Seriously, I use one that 2x the size of the one I use if I cook my oats on the stove. 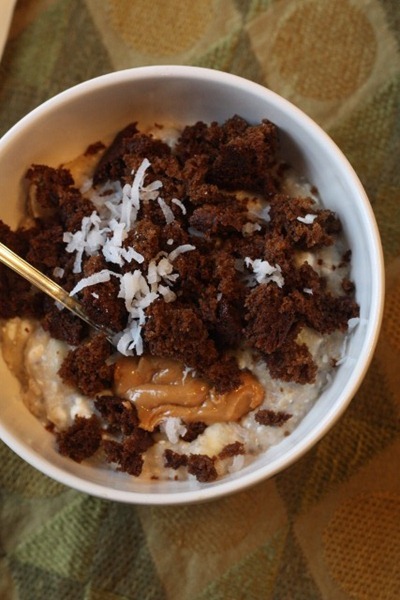 So worth it not to have the oatmeal all over the microwave and the bowl. I always cook them on the stove top. The very same method that I use for my whipped banana oats. (See the Tribute To Oatmeal page). If you want to avoid explosions, try doing them on power setting 5-6 for a longer amount of time. 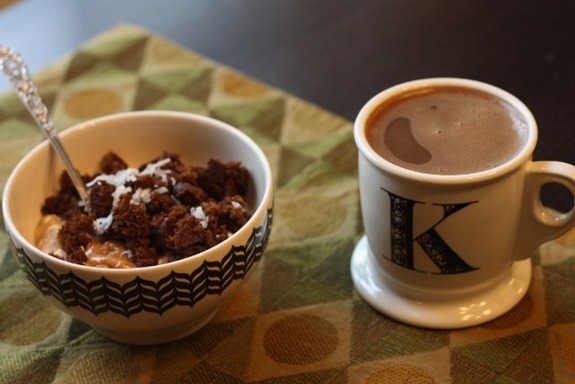 Breakfast looks awesome- you always inspire me to get even more creative with my oats! I absolutely freaking love anything and everything gingerbread. mmm! That’s a great oatmeal combo! I think I better try adding cottage cheese – that must make it awfully filling. Plus coconut. Mmmmm. gingerbread is one of my favorite things, especially paired with coconut. Great bowl of oats! You would probably think I’m a really dirty person! I only shower once a day – my skin gets too dry otherwise – usually at night! I love the gingerbread flavor! I’m sure it tastes GREAT in oats! A Gingy breakfast – how cute and festive! GOSH I wish we had sidewalks open for running/dog walking. Unfortunately they are buried beneath massive amounts of snow! LOL, mine too. We had over a foot additional overnight. yum – that muffin sounds so seasonal and festive! have fun on your run – switching up scenery is always a nice change! Good Luck at the Dentist! I see a Crescent moon and a tiny star in your coffee! Good luck at the dentist Kath!!! I’m going to dental school next year, so maybe you can come see mmeeeeee after i graduate!! 😀 heheheh Kath I totally ordered your Kali bowls on open sky even without the discount for myself as a X’mas present!!! It says a lot cuz i’m usually REALLY REALLY careful when it comes to spending money online. I make like…1 online purchase every 2 or 3 months!!! You’re a persuasive spokesperson love….one day…a sports brand will have to sign you on!! Maybe you can be my personal traveling dentist!? Glad you like the bowls! ohh delicious breakfast love the addition of the gingerbread muffin-so festive!! That oatmeal looks awesome with the muffin. ALl it needs is a little NuttZo–you have me hooked now! i really need to try the muffin/oats combination, it sounds and looks delicious. Good luck at the dentist! That is, by far, the best bowl of oatmeal my eyes have feasted on in a long time! Have a fun run! omg! 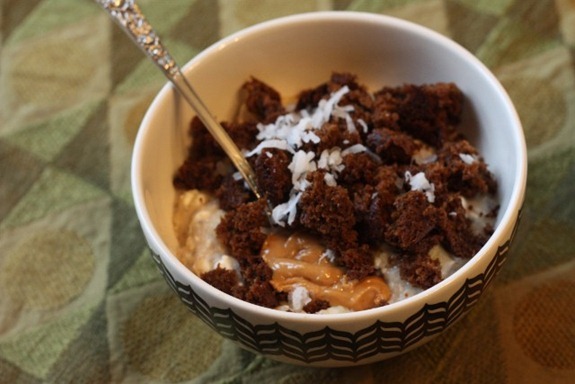 gingerbread in your oats…simply amazing! Good luck at the dentist…and that muffin in the oats. geeenius! I finally got the pacifier away from Kath with an old fashioned bribe: prizes from Toys R Us. She traded it for a Jem doll, a lunch box of some sort, and the Fisher Price swimming pool. The pool by the way, is still in the cabinet in the upstairs bathroom, awaiting a grandchild. Those sure were cool prizes! Seeing your coffee makes me want a french press! hope all goes well with the dentist and your run afterwards! I *love* combining running with errands or appointments. Knowing it’s a nice, runner-friendly neighborhood makes it even better. Haha…I leave the house without a shower about 90% of the time. I call it my “European” look. Your coffee is a smily face 🙂 do you see the tiny little eyes? Good luck at the dentist. Have a good run! Love the gingerbread muffin mix. I also like that you take the time to notice fun shapes in your coffee. Haha. I vote for the Kidney bean likeness. Good luck as the dentist! Oh and by the way, I love your new food images…lovely. 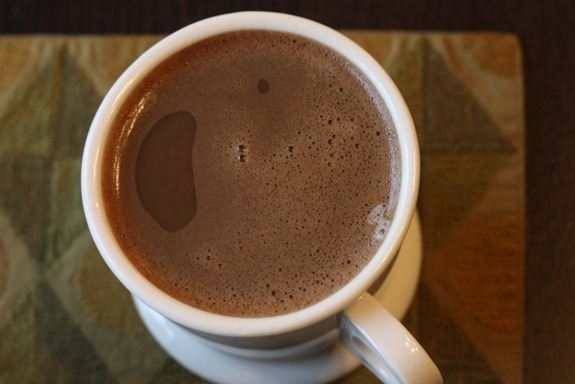 + Gingerbread= the best! So seasonal. 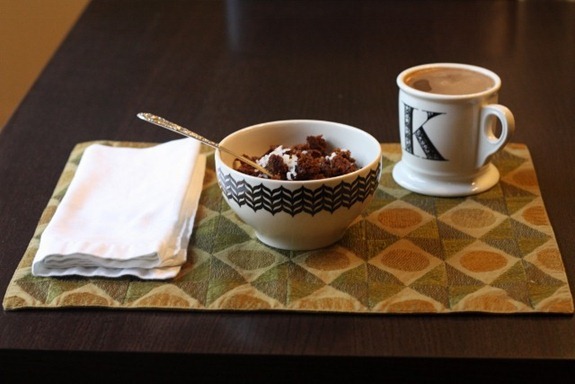 I totally agree that your bowl of oatmeal looks fabulous this morning! What a great mix! Uck, the the dentist is no treat. but your breakfast is! Great plan to get everything you wanted to do in there. Good luck on the no cavities! The dentist is so frustrating!!!!! Oh, I’m going to Anchorage on Friday, the home of Alaska’s only Great Harvest store. I hope they have gingerbread muffins! We love gingerbread. lmao. I had NO idea what you were talking about with the kidney or lima bean thing for like 5 minutes. I scrolled back through your post. I’m like, what is she talking about? Good luck at the dentist! i just found your blog & i think all of your breakfast look so yummy i wanna run out to buy some oatmeal & eat it everyday!! I say the coffee image is a pea that fell out of its pod. i say it’s a moon and a star!